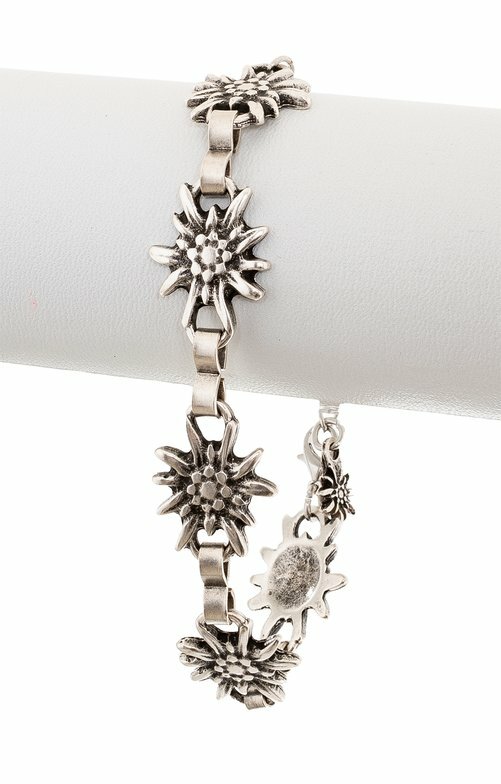 Trachten bracelet by Schuhmacher, with edelweiss motif in old-silver look. The edelweiss blossom is the most famous, most symbolic alpine flower and is featured in countless tales. The flower signifies beauty, desire and honesty. This Schuhmacher armband embraces tradition and transforms five edelweiss motifs into an attractive link chain. This simple design means that the blossoms take centre stage and means there's no need for extra unnecessary frills. The bracelet is fitted with a lobster clasp and a small chain, so that you can adjust the size to best fit your wrist. A wonderful piece of jewellery with a fierce character, this accessory can be worn all year round. Of course, it also looks fabulous worn with jeans in a country house look. Sehr schönes Armband, Qualität gut, passend zu Edelweiß-Schmuck und -Aufdrucken. Sehr gut zu kombinieren mit der Edelweis-Halskette. Sehr schönes Armkettchen, aber leider ging es zurück, da zu groß für den dünnen Arm meiner 13-jährigen Tochter! Sieht gut aus und paßt perfekt. Passt super zur Tasche (schwarz mit Edelweiß)!